People on Easter Island and the Hawaiian Islands are moving to higher ground. The 8.8 magnitude earthquake's shockwave is expected to hit Hawaii at 11:19 PST 4:19pm EST, 10:19am locally. The picture from Chile is confused, as one might expect. Chile's second-largest city Concepcion was only 70 miles from the epicenter, but most of the damage reports are from the capital, Santiago three times at far away (I imagine because that's where the journalists are). The death toll of 87 122 149 over 300 seems bound to rise significantly. The aftershocks are big earthquakes in their own right: 6.2 and 6.9. Tsunami warnings have been issued widely: "The Pacific Tsunami Warning Center issued a warning for Chile and Peru, and a less-urgent tsunami watch for Ecuador, Colombia, Panama, Costa Rica and Antarctica." TV Chile reported that a 15-story building collapsed in the hardest-hit city of Concepcion, where cracks opened up in the streets. Buildings caught fire, road bridges collapsed and residents huddled in streets full of rubble of masonry and glass from destroyed homes. Many were terrified by powerful aftershocks and desperately trying to call friends and family. UPDATE 2: The death toll is now over 700, with 2 million displaced (http://www.nytimes.com/2010/03/01/world ... le.html?hp). Last edited by EMTP on Sun Feb 28, 2010 11:22 pm UTC, edited 5 times in total. So far, it sounds like Chile came out in much better shape then they could have - possibly because they are a reasonably developed country that has a history of major earthquakes. BBC is reporting that, while cell service is down, internet (and presumably power, too?) and running water at least seem to be functioning. Santiago's international airport is out of commission - but they figure it'll only take a couple of days to get it open again. While this is certainly a disaster, it's nowhere near what it might have been, and Chile deserves some credit for doing things right, I think. They survived a 9.5 in 1960 with fewer than 2,000 deaths, which speaks well of their preparation. However, I'm concerned that the bulk of the reports are from Santiago, 200 miles away, where buildings collapsed and dozens were killed. 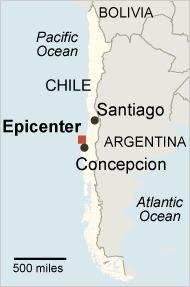 How are things in Concepcion, Chile's second-largest city and 70 miles away? When we know that, we will know the scope of the disaster. Rescue teams are finding it difficult to reach Concepcion because of damage to infrastructure, national television reported. Having just come back from a semester abroad in Valparaiso, Chile, this is pretty shocking. I'm thankful that I'm not there now. But my heart goes out to all my family and friends who are there. It's a terrible situation to be in, but it's certainly better than it could be (i.e. Haiti). Tsunami fears are a little surreal. I have an uncle living in Hawaii and an aunt living in New Zealand. I'm currently living in Santiago, the capital city, and I was in the basement of a club full with people when this happened. It was pretty scary stuff; I actually wondered for a second what I would do if the ceiling were to suddenly collapsed and I was trapped in the debris. The streets were very chaotic, too; You could see some debris that had fallen from old buildings, most street lights and traffic lights were off and some people were driving crazily. I had to go around the city dropping off friends because I was basically the designated driver and it was frantic, but thankfully nothing happened to us, nor at least any of my close friends and family. My house was mostly intact, with the exception of some CD's, books and other stuff that fell off. This was in Santiago, some 200 miles away from the epicenter. The official death toll is at 147 in the whole country as of this post, which thankfully isn't as bad as it could be considering that the magnitude of the earthquake was over 500 times as much as that of Haiti, but we have a long history of earthquakes and most buildings are built with that in mind. It was still scary not being able to call anyone and not knowing what was going on due to lack of phone signal, power and internet for a few hours. Hopefully there will be no more (or very few) deaths and hopefully we'll be able to reconstruct and get over this nasty episode quickly enough. It was pretty crazy, I was alone in my house, my sister is in the south, nearer to the epicenter and my mom was in a 10 story building. Thankfully nothing happened to us (not even one broken dish). So far 214 or more people have died, and many more are hurt or had their homes destroyed, right now Im watching the news, they say this is the sixth most powerful earthquake since they started measuring them. There have been some tsunamis, one of theem 400 meters into the land in Juan Fernandez island. All in all, things are under control it seems, though. Does anyone know if any tsunami has hit Hawaii from this? cjmcjmcjmcjm wrote: Does anyone know if any tsunami has hit Hawaii from this? The story is being continually updated but there hasn't been news of a "The Perfect Storm"-style wave yet. Douglas Adams wrote: In the beginning the Universe was created. This has made a lot of people very angry and has been widely regarded as a bad move. A friend of mine in Hawaii says the tsunami was about 3 ft high. "Don't you think that is going a bit over-board..."
4 waves hit, none were very major. Elvish Pillager wrote: See? All the problems in our society are caused by violent video games, like FarmVille. Any seismologists around ? How exactly do you read those graphs - http://aslwww.cr.usgs.gov/Seismic_Data/heli2.shtml ? I can understand why Chile one is almost black, but why are the others ? A day earlier in Concepción, the police fired water cannons and tear gas to disperse hundreds of people who forced their way into shuttered shops . But law enforcement authorities, heeding the cries of residents that they lacked food and water, eventually settled on a system that allowed staples to be taken but not televisions and other electronic goods. That makes a dangerous amount of sense. Someone will hang for it. I heard on a few news reports that the sky actually changed colors during the quake. Is that even possible, and how would it happen? We got no tsunami. I'm not sure why, though. My condolences to the Chileans.